Four Women Airforce Service Pilots (WASPs) receive final instructions before a long-distance flight in the Martin B-26 Marauder "Dry Run." Left to Right: Marjorie "Sandy" Sanford, WASP class 43-W-5 (February 18, 1915-May 10, 2008); Shirley Slade, class 43-W-5 (April 4, 1921-April 26, 2000); Evelyn L. "Fletch" Fletcher, class 43-W-6 (died prior to 2000); Elizabeth L. "Lib" Gardner, class 43-W-6 (1921- ) and Captain (later Major General) Joe Thomas Scepansky (February 15, 1918- ). Scepansky was responsible for B-26 training during World War II, and went on to a distinguished career in the United States Air Force. Shirley Slade appeared on the cover of the July 19, 1943 issue of LIFE magazine for a story about WASP training. The women were part of a class of seventeen who trained at Dodge City in the B-26, which was regarded as a difficult airplane. The WASP founder, pilot and record holder Jacqueline Cochran, believed that if women could show they could fly the B-26, it would reflect well on the WASP program and "shame" the men into flying it. 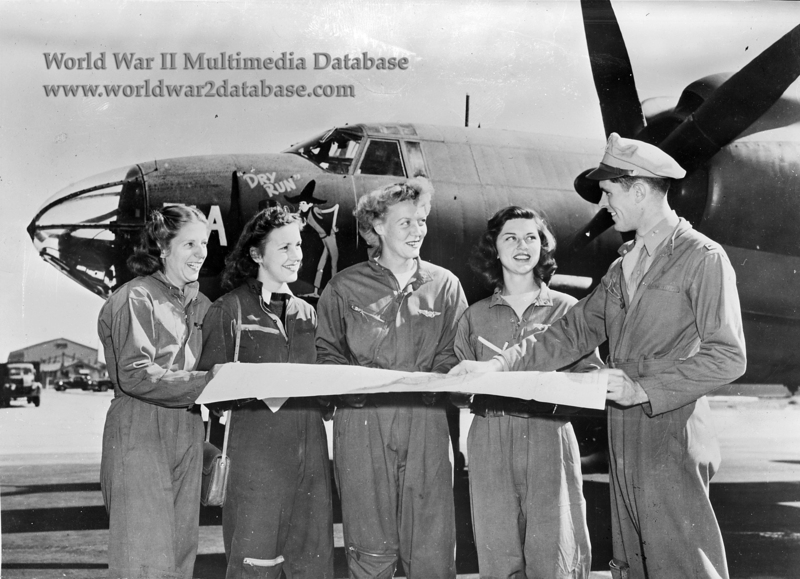 General Scepansky, the group commander at Dodge City where the women trained in the B-26, relates that while the women were initially under more scrutiny then the male pilots, they learned to fly the plane using trim tabs for finer control. WASPs had higher performance ratings than the men during the program. Despite a ban on fraternization with the male officers, the WASPs at Dodge City were welcome guests at the Bachelor Officer's Quarters Barracks Bar. After being ratified to fly the B-26, the WASPs were moved to Harlingen, Texas, where they flew pulling tow targets to train anti-aircraft gunners. After a WASP bill to give them military status failed in congress in 1944, the program was discontinued in the face of severe criticism. While few postwar jobs existed for women, Elizabeth Gardner managed to fly for Piper Aircraft, serving as the public relations specialist, writing speeches and giving demonstration flights. She survived a crash of a piper cub in January 1946. Most of the other WASPs were unable to secure paid flying positions after the end of the program. This photo appeared in the Chicago Tribune, the New York Times, and many other publications between November 1943 and January 1944. Dodge City was declared surplus after the war; after a short time as a local civilian airport, it is a feed yard today.